Space rock is the main order of business on this split. It’s a disc that’s got three songs by one band and one from another. 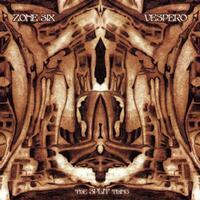 I previously reviewed a full disc from the band providing one song here, Zone Six. This is a good introduction to two cool space rock bands, that much is certain. This cool space rock instrumental starts off a bit like Hawkwind, but then works to something that has more of a retro progressive rock meets fusion and psychedelic sound. The keyboard sounds are the biggest driving factor of the piece. A faster paced jam later takes into more pure psychedelic territory. A fast paced bit closes it. Spacey keys open this and the cut works out into a dreamy sort of electronic meets space jam. As the jamming rises up it becomes sort of fusion meets space rock. There are several changes, but overall this is quite a smooth ride. Some nice spacey keyboards end this. We get something that’s sort of more of the same, but it’s got a lot of energy and just plain rocks with some great space sounds. At times it drops to just keyboards. It also becomes one of the most powerful and hard rocking tunes of the three from this group. Zone Six comes in fairly hard edged on this epic piece and then modulates through a number of moods and changes. Hawkwind is certainly well represented in terms of influences here. This, like a lot of space rock, doesn’t change quickly, but change is ever-present. At times it’s harder rocking, at times mellower. Perhaps a closer reference than Hawkwind would be Oresund Space Collective. This music certainly fits well along the same lines as that music does. At times this gets pretty heavy, but the space elements are never lost in the shuffle.